This video requires the latest Realvideo plug-in. If you do not have it, please click the icon below to download a copy. In 1999, Maine Governor Angus King Jr. asked Seymour Papert to develop a model of what learning might look like in the future. Paperts forty years of work with children and computing, as well as the historic impact information technology is having on society, requires that this vision for the future of learning would involve computers. The result of this collaboration was the Constructionist Learning Laboratory (CLL) at the Maine Youth Center (MYC), the state facility for adjudicated youth. The intent of the CLL is to create a rich constructionist learning environment in which severely at-risk students are engaged in long-term projects based on personal interest, expertise and experience. 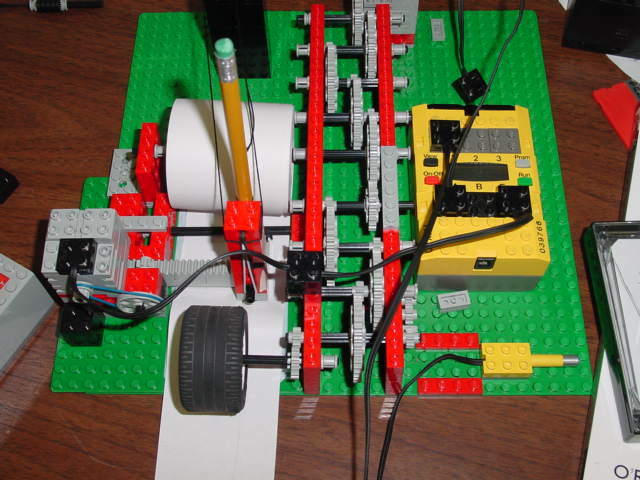 Students use computational technologies, programmable LEGO and more traditional materials to construct knowledge through the act of constructing personally meaningful projects. Personal digital technologies offer a powerful medium for the construction of knowledge in a social setting. Earlier research supports the hypothesis that children are capable of constructing knowledge when using computational materials in a social setting. While some efforts at school reform have embraced one or two of the ideas mentioned above, few public schools have attempted to eliminate age segregation and compartmentalized curricula while supporting project-based learning, reflective practice and ubiquitous computing simultaneously. The CLL combines the theory of constructionism with powerful ideas from the school reform movement. CLL projects connect student interests and experience with powerful ideas through aspects of the engineering process. Through their exploration of powerful ideas, the CLL participants make an important contribution to knowledge by helping to construct a dynamic model of constructionism. 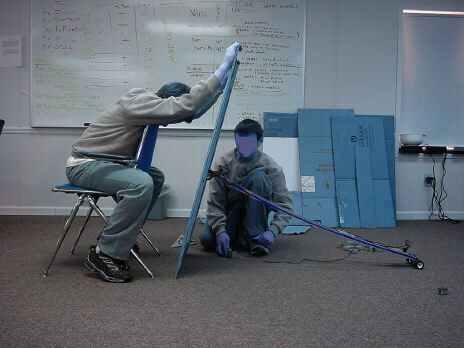 While much has been written about the theoretical basis for constructionism attempted in more traditional school settings, the CLL project offers the first opportunity to document a full-scale implementation of constructionism in an computationally-rich alternative learning environment built and directed by Papert. This research documents the activities, reflections and artifacts of students and adults learning in the Constructionist Learning Laboratory in another step towards defining constructionism as a viable learning theory. In 1999, Maine Governor Angus King Jr. asked Seymour Papert to develop a Maine-based model of what learning might look like in the future. Paperts work with children and computing, as well as the historic impact information technology is having on society, requires that this vision for the future of learning would involve computers. The result of this collaboration was the creation of the Constructionist Learning Laboratory (CLL) at the Maine Youth Center (MYC). The MYC is the state facility for adjudicated youth. Approximately 230 residents, ages 11-21, are detained at the Youth Center for a wide range of offenses. The majority of the residents are detained for weeks or months, others years. The traditional high school at the MYC is challenged by low student motivation, poor literacy levels, negative school experiences, a high number of students classified as being learning disabled and a rigid cumulative high school curriculum that takes little notice of the transient student population. The CLL is an alternative learning environment, created within the grounds of the MYC. The Governor and State Commissioner of Education recognized the futility of teaching children with a long history of school failure in the same unsuccessful ways. The CLL offers a model of constructionism complete with ubiquitous digital technology and important school reform strategies with a population of at-risk students. The goal is to engage these children in unprecedented learning activities while offering the world a new way of thinking about creating learning environments for the 21st Century. Each CLL student has a personal computer and access to a variety of materials. Students are expected to engage in personal and collaborative learning projects in which they construct knowledge, often by making something tangible. Some student artifacts have included a variety of robots, video games, plays, poetry, claymation, hand-crafted wooden guitars, ultra-light gliders, digital films. The students enjoy access to an extensive classroom library and constructive material including programmable LEGO. The projects connect student interests and experience with powerful ideas through aspects of the engineering process - tinkering, prototyping, testing, building, debugging and the presentation of a finished product. The teacher's role is to support the students in the construction of their projects and help learners make explicit connections to the important scientific, mathematical, historical or artistic ideas implicit in their work. In his most recent book, The Connected Family (1996), Papert states, nothing beautiful is forced. The CLL strives to create an environment in which young people are engaged constructively, but without the coercion so often associated with traditional curricula. The absence of a bell schedule, tests and artificially segregated subject-area classes allows students to make connections between disciplines. They can work in depth on personally meaningful projects without the disruptions associated with high-stakes testing or competition fostered by traditional schooling. Students have the time to make mistakes, redefine their goals and develop the technological fluency required for realizing their objectives. Reflective practice is an important part of this learning process. Students are encouraged to document their own learning through personal portfolios, sketches, photography, videotape and contributions to the class newsletter. The social culture of the CLL values collaboration, idea sharing and a sense of community. These skills are critical for a successful life, but may have been rarely experienced by the teens in the Youth Center. A full-time teacher and a special projects leader work with the students on a daily basis while volunteers and experts are brought in to lead week-long immersive workshops. Students have already enjoyed such intensive workshops in drama, film-making, African drumming, electronics, radio journalism, career preparation and video game design. Skills and insights gained during these residencies are then used by students in their personal projects. Visitors also play a critical role in the professional development and continuous inspiration of the full-time teachers. Brief mini-tutorials are organized to teach specific MicroWorlds Pro programming concepts or explain scientific principles. Such instruction is designed to assist students in developing their own technological fluency in service of the development of increasingly sophisticated projects. As a result, students are able to express themselves and their ideas through a rich array of tools, strategies and media. The CLL has allowed many children to feel intellectually powerful and creatively expressive for perhaps the first time in their lives. 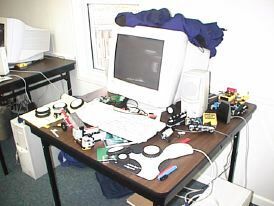 A desk similar to the one pictured in figure 1 might be found in the office of a great scientist or noted intellectual. This desk belongs to a CLL student classified by the traditional school system as illiterate. In the CLL the personal computer is truly personal. All students have their own and use them as a medium for constructing new things, a portfolio for keeping track of their own progress, an intellectual laboratory and a vehicle for self expression. Students program in MicroWorlds Pro, control robots with Yellow Brick Logo, edit video, publish newsletters and document their learning processes via the computer. Perhaps the best way to understand the nature of the CLL is by discussing a sample of the activities which took place within its first year of operation. One student read newspaper articles detailing Coca Colas plans to test a new vending machine that would charge more for a soft drink on hot days. 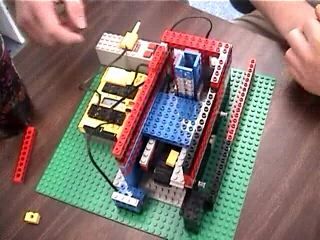 Most CLL students thought this was unfair, but it was suggested that they could build a working prototype of the vending machine out of LEGO. Although the student protested that he couldnt build something that complicated, he and a classmate began work on the construction of such a device. Figure 2. Having triumphantly constructed and programmed a successful temperature-sensitive Coke machine, the student proceeded to write a letter to the Chairman of Coca-Cola. The letter included photos of his prototype and an offer to build a full-scale model. The student received a letter denying that the company had ever contemplated charging customers in such a way. The disappointed (and thirsty) student then put his letter alongside of the letter from Coca-Cola and the newspaper articles announcing the new machine in the class newsletter. 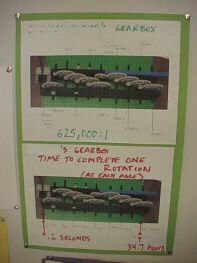 The same student then constructed an ingenious conveyor belt system designed to route baggage at an airport. Different color LEGO bricks were used to represent bags heading for one of four airplanes. A light sensor was calibrated to report the amount of light reflected off each color brick. This data was used to teach the programmable LEGO brick to automatically direct the baggage in one of four different directions. All sorts of engineering problems dealing with ambient light, sensor errors, gearing, timing and structural concerns had to be overcome in order to construct the brilliant piece of robotic engineering pictured in figure 3. Students build robotic arms, machines that play the xylophone, robot sumo wrestlers, machines that can mechanically write their name and gearboxes that can pull impressive quantities of mass figures 4 & 5. They are expected to explain their inventions and the process they experienced constructing a working device. Learners use various media to document their learning processes and to archive their finished product in an attempt to demonstrate their knowledge and reflect on their learning. Is this cheating or just good science? Themes often link a variety of projects and connect the learning experiences to a larger body of knowledge. Themes may be related to content areas such as optics or organized around a challenge. 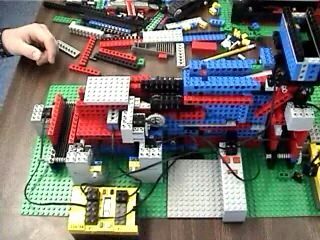 One such theme involved challenging the students to build a LEGO vehicle capable of climbing the steepest ramp. The competitive nature of this challenge led students to construct countless vehicles. Observations and data collected from previous attempts guided the systematic development of more sophisticated devices. Students soon understood that there were only four causes of failure: too much friction; too little force; center of gravity; structural inadequacy (it busts apart). Such important scientific principles guided significant improvements in subsequent vehicles. One girl decided to put sandpaper on the ramp to see if it would aid in the climbing effort. The young engineer tried different grades of sandpaper and when she found the sandpaper responsible for the best climbing she decided to investigate the reasons why. The sandpaper and LEGO tire were examined under a microscope. Had this been an ordinary microscope no discovery would have been made. The Intel/Mattel microscope allowed the student to print out the magnified images of the two surfaces. By looking at these printouts side-by-side the student was able to see that the surface of the tire and sandpaper were similar enough to work like teeth in two gears  thereby allowing the vehicle with those tires to climb a ramp made of that surface. One group of students noticed that their vehicle attempted to climb the wall after reaching the top of the ramp. This observation inspired many additional explorations, including the question of building a vehicle that could climb an incline greater than ninety degrees. One ingenious student asked the teacher what she meant by climb the ramp? She improvised an answer that climbing the ramp meant that the front wheels of the vehicle had to cross a particular line. He asked if she were sure and when satisfied with the ruling set-off to defy physics by constructing a vehicle capable of climbing an incline of approximately 110 degrees. The result may be seen in figure 7. While traditional curricula would allow a teacher to check off uses a protractor from a list of objectives, the kids in the CLL learn so much more. Students attempting to win the ramp climbing challenge learned a great deal about perseverance, debugging, gearing, limits, scientific conventions, programming, force, friction, magnification, center of gravity, structures, the scientific method and many more powerful ideas by doing science rather than being taught about science. The CLL does not focus exclusively on the use of computers by students. Kids read books, write plays, produce videos and publish newsletters. In fact, exciting work has been done with wood. Under the direction of John Stetson, CLL kids have built beautiful handcrafted classical guitars. These instruments are complete with wood inlay and reflect a level of precision usually reserved for master craftspeople. These guitars require hundreds of hours of careful labor and provide opportunities to confront challenges like humidity. Kids learned that if the humidity is not within a certain range, their wood may swell or crack. Humidity was not merely a vocabulary word for them, but rather a force of nature they needed to overcome. The construction of ultralight airplanes capable of flying for minutes unpowered, handmade telescopes and camera obscuras offer these learners opportunities to better understand the world around them. It is hoped that these powerful experiences provide students with a way of viewing the world so they may live happily and make important contributions to the world of ideas. Constructivist learning theory is associated with the work of Jean Piaget and Lev Vygotsky. Constructivists argue that knowledge is not transmitted, but constructed. Each individual must reconstruct knowledge and this learning process happens within a material environment, a culture and a supportive community of practice. While constructivism defines learning as the building of knowledge structures inside of ones head, constructionism suggests that the best way to ensure that such intellectual structures form is through the active construction of something outside of one's head, that is something tangible, something shareable. Where constructivism could be simply expressed as learning by doing, constructionism is learning by making. However, Paperts play-on-words is a deliberate attempt to both extend the notion of constructivism and offer a critique of its misuse in thinking about schooling. Papert is critical of how constructivism may be interpreted to mean the construction of knowledge without a context of use. This disassociation of knowledge without the context of use may contribute to weaker understanding, coercive curriculum and negative attitudes towards learning. In attempts to implement constructivist theory, teachers and curriculum designers often create situations in which a student will discover a particular concept, rule or fact without any authentic context or motivation for making such a discovery. The deliberate attempt of one person to lead another to discover a concept deprives the learner of a powerful intellectual adventure. Piagets powerful idea that all learning takes place by discovery is emasculated when school practice translates this idea into discovery learning. This idea is disempowered when it is orchestrated by the preset agenda of a curriculum. Learning is also weakened because the ideas being learned are disempowered by the act of removing them from a context for authentic discovery arising from need or serendipity. Constructionists are concerned with the goal of re-empowering the powerful ideas learned by students by taking a step towards re-empowering the idea of learning by discovery. (Papert 2000) Elaborate real world scenarios created by educators often do great violence to the important idea that knowledge is situated, by forcing students to confront a concept they see to have little relevance now or in the future of their high-tech society. Papert argues that cognitivists also misinterpret constructivism by believing that a student will learn better by understanding the intellectual methods used for solving a particular problem if she understands the concepts behind them. This might be so if the student appreciates the beauty or power of those ideas, but in too many cases the cognitivist is trying to get the student to see the connection between one set of ideas about which she does not care and another. The cognitivist does little to create an environment in which a student can experience the same intellectual situation in which those ideas were invented. This may lead ultimately to weaker understanding of that concept and a poorer concept of the individual as a capable learner. The theoretical basis for the CLL develops from Papert's work most completely described in his books Mindstorms: Children, Computers and Powerful Ideas (1981), The Childrens Machine (1993) and The Connected Family (1997). These seminal books in the field of educational computing detail more than four decades worth of thinking about learning with computers. Constructionism predicts that individuals learn best by mobilizing their entire selves in a personally meaningful pursuit while sensing that their work is valued as part of a larger enterprise. This type of learning is hard, long-lasting and requires more time than is typically afforded by the bifurcated secondary school curriculum. Constructionists recognize an important role for technology in learning. The computer is a particularly flexible, expressive and intellectually-rich medium for "messing about" with powerful ideas. For learners, the computer provides an unrivaled intellectual laboratory and vehicle for self-expression. The computer becomes the workspace within which students can, for example program video games, construct simulations, perform calculations, store their journals, publish newsletters, correspond with experts, edit video, produce animated films, learn to fly an airplane and much more. The exploration, construction and articulation of powerful ideas are at the focus of a constructionist learning environment. Seymour Papert believes that when ideas go to school they lose their power. (Papert 2000) It is therefore the challenge of a constructionist learning environment to create situations in which students may not only discover powerful ideas, but perhaps the most powerful idea of all  the idea of powerful ideas. Students in a constructionist learning environment will eagerly investigate powerful ideas at the forefront of intellectual exploration and express their knowledge through the construction of sophisticated long-term projects. It is believed that through the construction of personally meaningful projects students will not only develop content-area knowledge, but the habits of mind and social skills required to make contributions to society in the twenty-first century. In The Having of Wonderful Ideas, Duckworth (1996) supports the educational efficacy of student projects when she says that intelligence cannot develop without matter to think about. Making new connections depends on knowing enough about something in the first place to provide a basis for thinking of other things to do  of other questions to ask  that demand more complex connections in order to make sense. The more ideas people already have at their disposal, the more new ideas occur and the more they can coordinate to build up still more complicated schemes. This suggests that a child comfortable tinkering with familiar items and playing with ideas will gain the confidence and self-awareness required to solve a wide variety of problems. avoiding the feelings; "I cannot learn! I am stupid I am not good enough at this"
Harel demonstrated that children asked to learn traditional concepts in traditional schools were more likely to gain a deeper understanding of those concepts if immersed in a constructionist activity. The students in Harels research were asked to use Logo software and microcomputers to design educational software that would teach another child about fractions. Questions remain about the effect of limiting student learning to the arbitrary constraints of the curriculum. The existing body of research attempts to investigate the theory of constructionism in traditional schools. In other words, constructionist activities were executed in relatively unchanged schools. Since constructionist theory addresses both the cognitive and social aspects of learning, it is important to research the application of the theory in an environment designed from the bottom-up to reflect such principles. The learning environment embodied by the CLL addresses the challenges associated with changes in the nature of teaching and learning, professional development, curriculum, assessment and the use of personal computing in learning. These variables reinforce one another and are impossible to address in isolation. Cavallo, D. (1999) Project Lighthouse in Thailand: Guiding Pathways to Powerful Learning. In Logo Philosophy and Implementation. Montreal, Canada: LCSI. Duckworth, E. (1996) The Having of Wonderful Ideas and Other Essays on Teaching and Learning. NY: Teachers College Press. Harel, I. (1991) Children Designers: Interdisciplinary Constructions for Learning and Knowing Mathematics in a Computer-Rich School. Norwood, NJ: Ablex Publishing. Harel, I. (1993) Who is a Constructionist? a paper presented at the International Logo Conference, July 1993. Melbourne, Australia. Harel, I., and Papert, S., eds. (1991) Constructionism. Norwood, NJ: Ablex Publishing. Harel, I. And Papert, S. (1991) Situating Constructionism in Constructionism. Norwood, NJ: Ablex Publishing. Kafai, Y., and Resnick, M., eds. (1996) Constructionism in Practice: Designing, Thinking, and Learning in a Digital World. Mahwah, NJ: Lawrence Erlbaum. Newell, B. (1993) Untitled keynote address at the International Logo Conference. July 1993, Melbourne, Australia. Papert, S. (1980) Mindstorms: Children, Computers, and Powerful Ideas. New York: Basic Books. Papert, S. (1990) A Critique of Technocentrism in Thinking About the School of the Future, MIT Epistemology and Learning Memo No. 2. Cambridge, Massachusetts: Massachusetts Institute of Technology Media Laboratory. Papert, S. (1991) Situating Constructionism. In Constructionism, in Harel, I., and Papert, S., eds. Norwood, NJ: Ablex Publishing. Papert, S. (1993) The Children's Machine: Rethinking School in the Age of the Computer. New York: Basic Books. Papert, S. (1996) The Connected Family. Atlanta: Longstreet Publishing. Papert, S. (1999) The Eight Big Ideas of the Constructionist Learning Laboratory. Unpublished. Portland, Maine. Papert, S. (1999) What is Logo? Who Needs it? In Logo Philosophy and Implementation. Montreal, Canada: LCSI. Papert, S. (2000) Whats the Big Idea? Steps toward a pedagogy of idea power. IBM Systems Journal, Vol. 39, Nos 3&4, 2000. Resnick, M., and Ocko, S. (1991) LEGO/Logo: Learning Through and About Design. In Constructionism, in Harel, I., and Papert, S., eds. Norwood, NJ: Ablex Publishing. Turkle, S. (1991) "Epistemological Pluralism and the Revaluation of the Concrete. In Constructionism. Idit Harel and Seymour Papert (eds. ), Norwood, NJ: Ablex Publishing.